The Armanty stone has seemingly eluded thorough scientific scrutiny in the West. 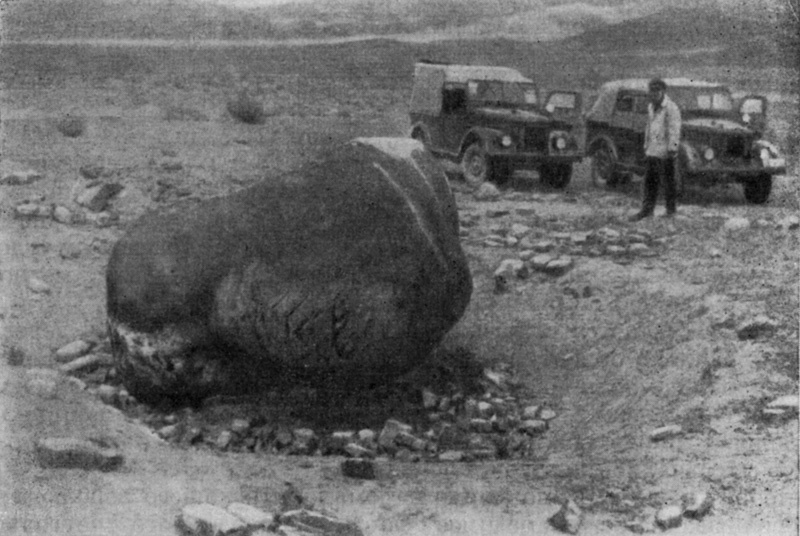 This may in part account for the details of its fall site in the Catalogue of Meteorites being open to question – certainly the location in the scientific record is at odds with the information given by Namnandorj in Meteorites of Mongolia. The co-ordinates of the site in the Catalogue entry are 47 N, 88 E, locating it in Mulei county of Xinjiang province, at this latitude some 150 miles or 240km inside China, while following the information given by Namnandorj from the Mongolian records, the stone lay close to the Chinese-Mongolian border on the Mongolian side, at a site whose co-ordinates would be closer to 47 N, 91 E. Not only from Namnandorj, but in Mongolian tradition, and demonstrably in the view of the Mongolian government in the 1920’s, the stone belonged in Mongolia. Clearly one of the locations put forward is erroneous. The problem may have arisen because the fall site lay on a disputed strip of land between the Chinese-Mongolian border and the Bulgan river, which runs to the east of it. The issue is discussed by Namnandorj, where it is mentioned that the Chinese territorial claim at this point extended eastwards up to the river. For this reason the Chinese disputed Mongol ownership of the stone, which certainly at that time lay in the location described by Namnandorj. Maps, both contemporary and modern, clearly show that the border is drawn to the west of the river, so that the site of fall as the Mongols knew it and as cited by Namnandorj, lay in Mongolian territory. The only other factor having a bearing on ownership might have been whether the site asserted to be the correct one by Namnandorj was affected at the time by a legitimate border dispute. 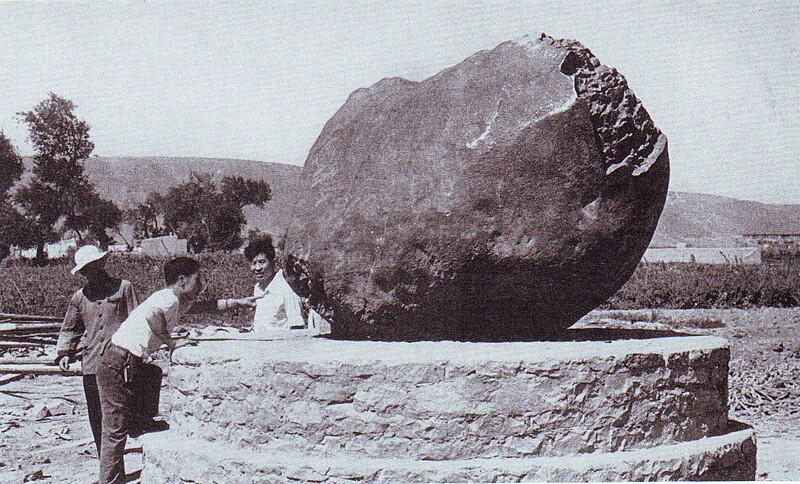 The Chinese, who also know the stone as the Gobi or Xinjiang meteorite, have provided co-ordinates – those given in the Catalogue – which at first appear to support their claim to the stone. Had it been true that the fall site was located 240km inside Chinese territory, this would never have given rise to a disputed ownership. Importantly, however, according to a report published in Sky and Telescope in December 1965, the Chinese undermined their case in two respects – by their removal of the stone from its actual impact site, and by initially stating that this site lay in Chingho county, on the Chinese side of the border with Mongolia – in reality this was adjacent to the actual Mongolian site – but then subsequently providing the demonstrably false co-ordinates. Thus it was that earlier in 1965 the Chinese authorities had sent a detatchment of forty men with a large tractor and a specially-built 24-wheel trailer with the task of transporting the stone across the Gobi desert to the city of Urumqi, a journey of some 400km from the original site. The two remarkable photos starting the sequence below seem likely to have been taken by the Chinese team sent to remove the stone and clearly show the shallow impact pit created by the fall. There appears to have been little or no disturbance at this stage in either the position of the meteorite or the impact pit; as such the first photo compares well with the depiction of the stone in Fig. 1 in the subsequent sequence. 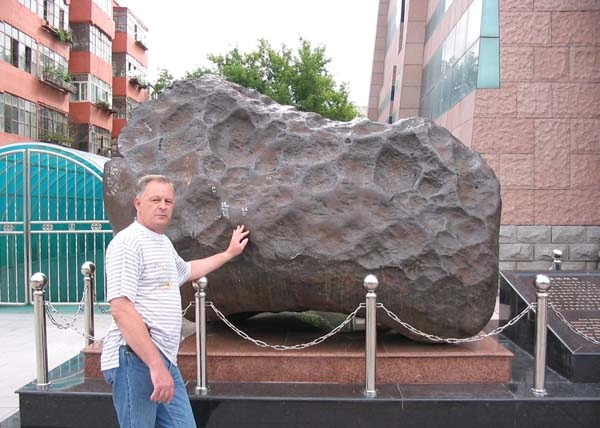 In Urumqi the meteorite was at first mounted on a stone platform, then on remounting placed on the present marble plinth, outside the Xinjiang Geology and Mineral Museum in the city. It is an open question whether the removal of the stone was an action jointly agreed by the Chinese and Mongolian jurisdictions, or was carried out unilaterally. The removal also deprived science of the opportunity of studying the stone insitu, its fall in the distant past having created a large shallow impact pit. At the time of its removal, some organic material beneath the stone was said to have been taken away by the Chinese for scientific analysis to try to determine the date of fall, although the results of this are not known. To this day the Chinese continue to assert the correctness of the co-ordinates they gave for the location from which the stone had been taken. The Chinese view was personally confirmed in August 1994 by Dr Robert Hutchison, the then leader of the Cosmic Minerology Programme at the Natural History Museum, in conversations during a visit to Xinjiang hosted by the Chinese Academy of Sciences. 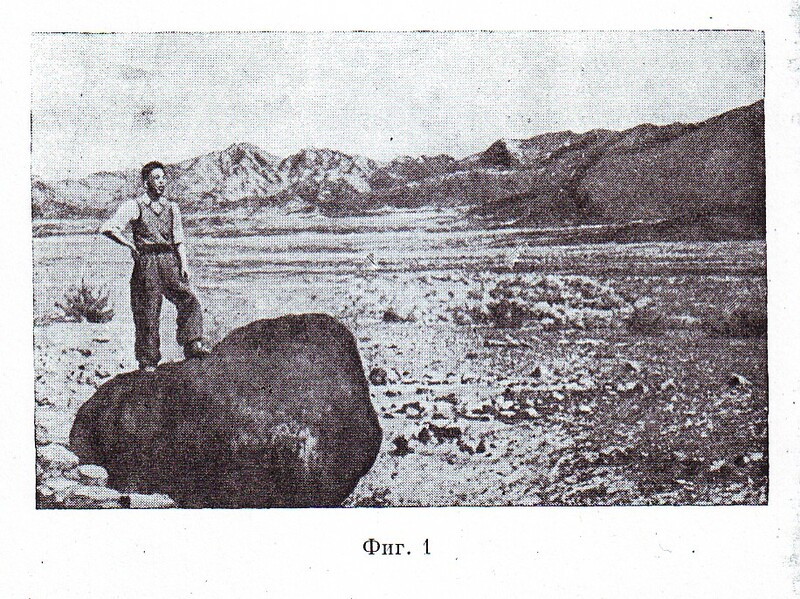 The Chinese offered no reason to Dr Hutchison for the removal of the stone to Urumqi. 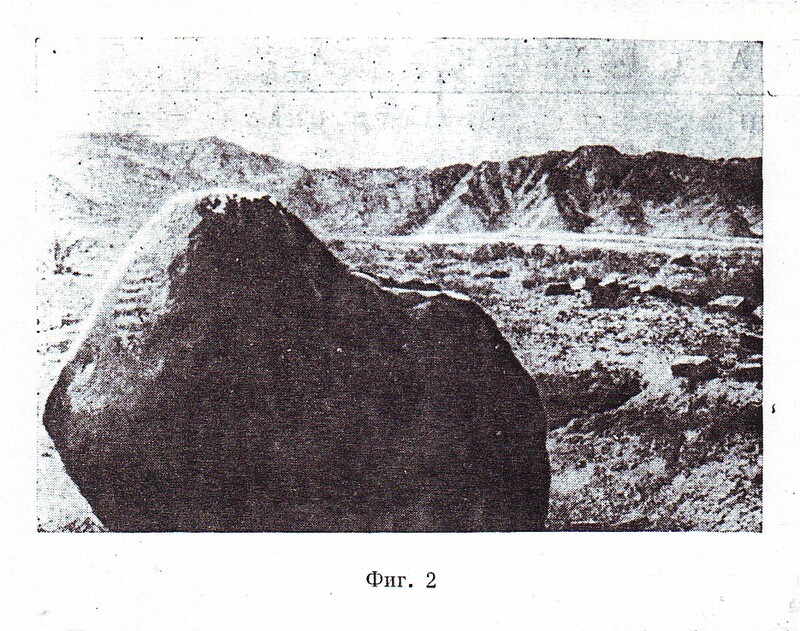 Although a visit to the fall site specified by the Chinese was said not to have been feasible at the time for ‘logistical’ reasons, Dr Hutchison was able to visit the stone itself in Urumqi on two occasions, 9th and 29th August. Subsequently he made two observations relating to its date of fall: he stated that the lack of legendary accounts of sightings of the passage of its fall through the atmosphere – which was likely to have been spectacular – and the surface condition of an exposed area of the stone which was likely to have been in contact with the soil insitu, were both characteristic of an ‘old’ fall – that is, one which took place in the distant past. Regarding the area of the stone Dr Hutchinson commented on, the appearance of the stone as mounted in Urumqi is on first inspection difficult to reconcile with its depiction in Figs. 1 and 2 below – and even the horizontal symmetry of the stone itself is such that, on overlaying outlines of the stone before and after removal, the possibility cannot be completely excluded that the stone has been mounted upside-down. Nowadays the question of the site of fall can undoubtedly be settled by examining satellite maps, both to locate the impact pit and to examine the surrounding landscape. Fortunately there exist the two photographs previously referred to, showing the stone insitu prior to its removal in 1965, which, being possibly unique in also giving a good indication of the background landscape, can be used as cross-references. 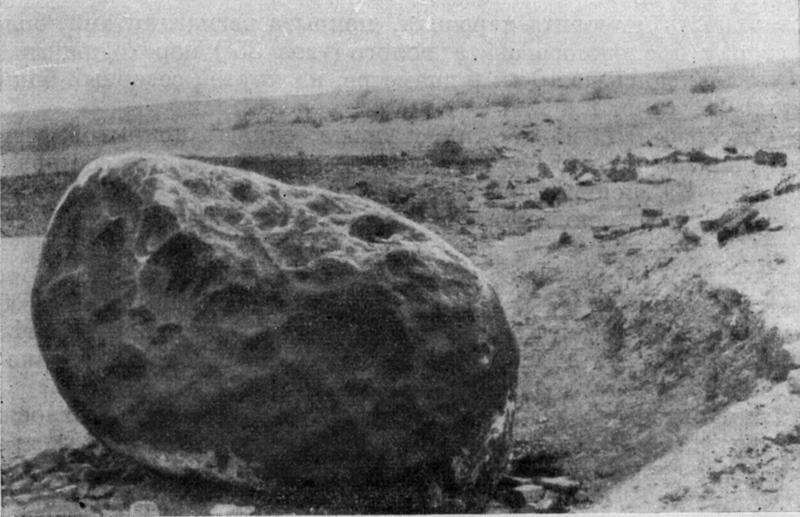 The pictures illustrate a short article about the Armanty meteorite published in the Soviet journal Meteoritika, Volume 22, 1962. When I carried out my own investigation of satellite maps, I first went to the vicinity of the location Namnandorj described, 47 N, 91 E, and then searched the surroundings for terrain similar to the Meteoritika photographs. Scanning the Chinese-Mongolian border areas a short distance to the south, I found a surface feature which seemed to match the characteristics of both the fall site given by Namnandorj and the reference photographs. Adjacent to the border on the Mongolian side is a rimmed oval feature, slightly narrowed at the eastern end, like a shallow pit or crater, and measuring approximately 1200m west to east and 600m north to south. Within the feature there appears to be a secondary elongated oval feature about 600m long, somewhat off-centre to the east, with a number of surface disturbances, ridges or undulations near its eastern end. The feature suggests that it may be of meteoritic origin, and if so is consistent with the angular descent of a stone from the east, impacting and settling near the east side of the ‘rim’, which itself would have been created by the scattering of debris forwards. I would place the impact point of the meteorite at 46 52′ 37″ N, 90 58′ 35″ E. The site can be viewed on Google satellite maps by entering the co-ordinates in the search field. The characteristics of the site’s surroundings observable in the Meteoritika photographs – a flat rock-strewn landscape fringed by foothills – are a convincing match with those in the satellite photographs. The picture on the title page of the article (Fig. 1) would look south across the Chinese border: the foothills and ridges in the middle distance, and the mountains beyond, correspond well with the satellite image. The other picture (Fig. 2) would look north-east: the escarpments in the middle distance match particularly well. Considering the probability of two sets of landscape features matching the satellite imagery in the close vicinity of the given location, many would say they provide incontrovertible proof that this is the Armanty site. Whether or not the site has been acknowledged and documented as such in current scientific literature, I have not hitherto encountered it; the recent history of the stone seems to have been forgotten about, or at least overlooked. As a corollary, using the co-ordinates given by the Chinese, a search on Google satellite maps for an impact feature, or for landscape characteristics similar to the Meteoritika photographs, yields nothing that can be imagined to match the features of the actual fall site which they depict. If the Mongolian feature is accepted as the Armanty site, we may draw a number of conclusions: that Namnandorj is correct in the information he gives and in stating that the site was in Mongolian territory, provided that the border was at that time also to the west of the site; that the site is located today in Mongolian territory; that the co-ordinates given by the Chinese are incorrect, being three degrees of longitude or about 240km to the west; and that since these are the ones given in the Catalogue of Meteorites, the entry should be amended. On the present evidence, the co-ordinates given by the Chinese are not only incorrect, they would appear to have been falsified in an attempt to demonstrate ownership of the stone; ironically however, they also provide the clearest indication that the removal of the stone was an illegal act. Far from lending support for their claim, their culpability would be compounded by the removal of the stone from its actual impact site. 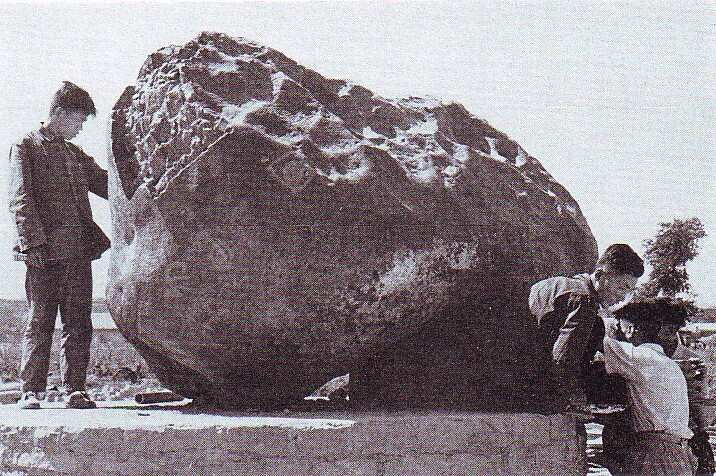 Thus unfortunately the great meteorite is no longer at the site of its fall, as it was during the Roerichs’ lifetimes. However, it will not go unnoticed by those who have followed and understood the direction of these researches, that if the meteorite is correctly identified as the parent of the Roerichs’ Stone, and if the site of fall is also correctly identified, then the location of the impact point of the great meteorite discloses the actual focus of the earthly Shambhala as the Roerichs understood it. This entry was written by ianheron, posted on March 1, 2012 at 4:29 pm, filed under Uncategorized. Bookmark the permalink. Follow any comments here with the RSS feed for this post. Post a comment or leave a trackback: Trackback URL.